Are you looking to go out in Paris, but craving something a bit different this time? Wine by One, a bar just north of Place Vendôme on the border between the 1st and 2nd arrondissements, offers do-it-yourself wine tastings for any budget. 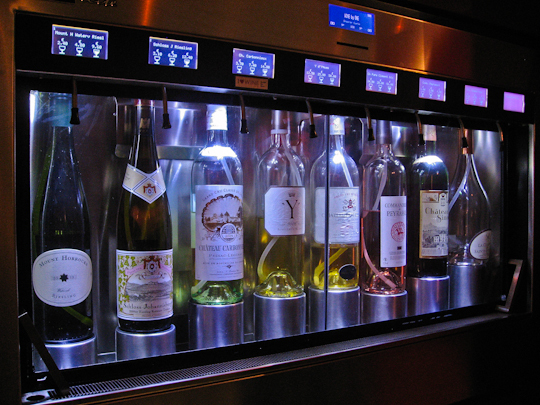 You could think of this bar as “upscale self-service”. First, you purchase a debit card with the amount you choose and grab an empty glass. Then, you are on your own to discover new wines. About 100 different wines line the walls in glass cases, starting with lighter whites and running the gamut through heavier reds and finally dessert wines. 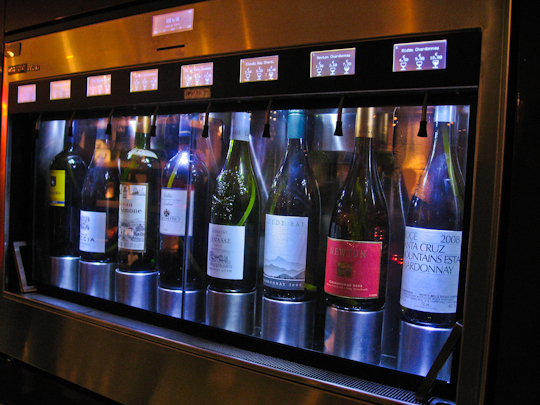 Small “smart” screens are installed by each case of wine to give you information on each wine so you can make an informed decision about which wine to sample. (Unless you’re like me and pick based on the proven complex formula: (prettiness of the label) x (π/(price)²)). The staff is also happy to assist you in your selections. When you have chosen your wine, insert your debit card and hold your glass under the spigot for the wine to be selected (this is a very important step) and tap the small screen above your wine of choice on the symbol for 1/4 glass, 1/2 glass or full glass. Wine by One is a great spot for wine connaisseurs or wanna-be wine connaisseurs: you can try 1/4 glass of some spectacular wines without having to pay for the whole bottle (still, you may find yourself paying nearly €30 for some). But Wine by One is also an ideal bar for those who do not drink much. You can try small samplings (some as inexpensive as €0.80) of four different wines that total just one full glass, and you are not splitting the bill with your wine-o friends at the end. In fact, one of my favorite things about Wine by One is that there is no bill at the end. This means you do not lose 15 minutes at the end of your evening begging for the check so you can leave. Given the location and the efficiency of the set-up, it is the perfect stop for a pre-theater drink. I am only disappointed that they are not open late. If you taste a wine you must have more of, Wine by One is also a wine shop – buy a bottle to take home! Hours: Tuesday – Friday noon to 10PM, Saturday 3PM to 8PM.